Translations created independently by people who saw this site and liked it. Thanks! This page shows you real ways you can get hit and real ways to avoid them. This is a far cry from normal bicycle safety guides, which usually tell you little more than to wear your helmet and to follow the law. But consider this for a moment: Wearing a helmet will do absolutely nothing to prevent you from getting hit by a car. Sure, helmets might help you if you get hit, but your #1 goal should be to avoid getting hit in the first place. Plenty of cyclists are killed by cars even though they were wearing helmets. Ironically, if they had ridden without helmets, yet followed the advice on this page, they might still be alive today. Don't fall for the myth that wearing a helmet is the first and last word in biking safety. In truth, an ounce of prevention is worth a pound of cure. It's better to not get hit. That's what real bicycle safety is about. TIP: The Uninsured Motorist clause on your auto insurance may pay if you're hit & runned while bicycling. Check your policy. The next most common bike safety advice after "wear a helmet" is "follow the law," but most people are already aware that it's stupid to race through a red light when there's cross traffic. So the "follow the law" advice isn't that helpful because it's too obvious. What you'll find here are several scenarios that maybe aren't that obvious. The other problem with the "follow the law" message is that people may think that's all they need to do. But following the law is not enough to keep you safe, not by a long shot. Here's an example: The law tells you to ride as far to the right as is practicable. But if you ride too far to the right, someone exiting a parked car could open their door right in front of you, and you'll be less visible to motorists pulling out of driveways and parking lots, and motorists coming from behind may pass you way too closely in the same lane because you didn't make them change lanes. In each of these cases you were following the law, but you made it easier for yourself to get hit. This page doesn't focus on the law, it focuses on how to not get hit by cars. Now let's see how to avoid getting hit. This is the most common way to get hit (or almost get hit). (source1, source2) A car is pulling out of a side street, parking lot, or driveway on the right. Notice that there are actually two possible kinds of collisions here: Either you're in front of the car and the car hits you, or the car pulls out in front of you and you slam into it. 1. Get a headlight. If you're riding at night, you absolutely should be using a front headlight. It's required by law, anyway. Even for daytime riding, a bright white light that has a flashing mode can make you more visible to motorists who might otherwise Right Cross you. Look for the new LED headlights which last ten times as long on a set of batteries as old-style lights. And headlamps (mounted on your head or helmet) are the best, because then you can look directly at the driver to make sure they see your light. 2. Wave. If you can't make eye contact with the driver, wave your arm. It's easier for them to see your arm going left and right than it is for them to see a bicycle coming straight towards them. 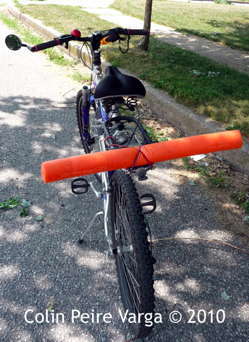 You could also use a loud horn (like the Air Zound) to get drivers' attention. If it looks like the driver is about to pull out without seeing you, yell "Hey!" You may feel awkward waving or yelling, but it's better to be embarrassed than to get hit. Incidentally, many countries require bells on bicycles, but the U.S. doesn't. 4. Ride further left. You're probably used to riding in the "A" line in the picture, very close to the curb, because you're worried about being hit from behind. But take a look at the car. When that driver is looking down the road for traffic, he's not looking in the bike lane or the area closest to the curb; he's looking in the middle of the lane, for other cars. The farther left you are (such as in "B"), the more likely the driver will see you. There's an added bonus here: if the motorist doesn't see you and starts pulling out, you may be able to go even farther left, or may be able to speed up and get out of the way before impact, or easily roll onto their hood as they slam on their brakes. In short, it gives you some options. Because if you stay all the way to the right and they pull out, your only "option" may be to run right into the driver's side door. Using this method has saved me on three occasions in which a motorist ran into me slowly as they hit their brakes and I wasn't hurt, and in which I definitely would have slammed into the driver's side door had I not moved left. You might worry that moving left makes you more vulnerable to cars coming from behind. But the stats say you're far more likely to get hit by a car at an intersection ahead of you that can't see you, than from a car behind you which can see you clearly. So while both positions have risk, you generally reduce your risk by riding a little farther left. Your actual lane position depends on road conditions. On fast roadways with few cross streets (and thus less chances to get hit at intersections), you'll ride farther to the right. On slow roads with many cross streets, you'll ride farther left. See lane position for more about this. A driver opens his door right in front of you. You run right into it if you can't stop in time. This kind of crash is more common than you might think: It's the second-most common car-bike crash in Toronto,(source) and the #1 crash Santa Barbara. (source) We've compiled a huge list of cyclists killed by running into open car doors. Ride to the left. Ride far enough to the left that you won't run into any door that's opened unexpectedly. You may be wary about riding so far into the lane that cars can't pass you easily, but you're more likely to get doored by a parked car if you ride too close to it than you are to get hit from behind by a car which can see you clearly. You're riding on the sidewalk, you cross the street at a crosswalk, and a car makes a right turn, right into you. Drivers aren't expecting bikes in the crosswalk, and it's hard for them to see you because of the nature of turning from one street to another, so it's very easy for you to get hit this way. In fact, this collision is so common we've lost track of the number of people who've told us they were hit this way, such as Ray John Ray. One study showed that sidewalk-riding was twice as dangerous as road riding, and another study said it's even more dangerous than that. 1. Get a headlight. If you're riding at night, a headlight is absolutely essential. It's required by law, anyway. 3. Don't ride on the sidewalk in the first place. Crossing between sidewalks is a fairly dangerous maneuver. If you do it on the left-hand side of the street, you risk getting slammed as per the diagram. If you do it on the right-hand side of the street, you risk getting slammed by a car behind you that's turning right. Sidewalk riding also makes you vulnerable to cars pulling out of parking lots or driveways. And you're threatening to pedestrians on the sidewalk, who could get hurt if you hit them. These kinds of accidents are hard to avoid, which is a compelling reason to not ride on the sidewalk in the first place. In addition, riding on the sidewalk is illegal in some places. Some special sidewalks are safe to ride on. If the sidewalk is really long (no need to frequently cross streets), and free of driveways and peds, then there's little risk to you and others. Just make sure when you do cross a street or driveway that you slow down considerably and that you check the traffic in all directions, especially behind you if you're riding with the flow of traffic. Even worse, you could be hit by a car on the same road coming at you from straight ahead of you. They had less time to see you and take evasive action because they're approaching you faster than normal (because you're going towards them rather than away from them). Cars will approach you at a much higher relative speed. If you're going 15mph, then a car passing you from behind doing 35 approaches you at a speed of only 20 (35-15). But if you're on the wrong side of the road, then the car approaches you at 50 (35+15), which is more than twice as fast! Since they're approaching you faster, both you and the driver have lots less time to react. And if a collision does occur, it's going to be at a faster relative speed. Riding the wrong way is against the law and you can get ticketed for it. A car coming towards you makes a left turn right in front of you, or right into you. This is similar to #1, above. Austin cyclists hit this way include Dr. Lee Chilton, John Howell (former president of the Austin Cycling Association), and Janne Osborne. 3. Use a mirror. If you don't have one, get one from a bike shop or an online shop right now. There are models that fit on your handlebars, helmet, or glasses, as you prefer. You should always physically look back over your shoulder before moving left, but having a mirror still helps you monitor traffic without constantly having to look behind you. 4. Signal. Never move left without signaling. Just put your left arm straight out. Be sure to check your mirror or loo behind you before signaling (since a car passing too closely can take your arm out). A car runs into you from behind. This is what many cyclists fear the most, but it's actually not very common, comprising only 3.8% of collisions. (source) However, it's one of the hardest collisions to avoid, since you're not usually looking behind you. The risk is likely greater at night, and in rides outside the city where traffic is faster and lighting is worse. The three cyclists killed when hit from behind in Austin in 96-97 were all riding at night, and at least two of them didn't have lights on their bikes. (source) The best way to avoid getting Rear-Ended is to ride on very wide roads or in bike lanes, or on roads where the traffic moves slowly, and to use lights when biking at night. Bike shops have red rear blinkies for $15 or less. These kind of lights typically take two AA batteries, which last for months (something like 200 hours). I can't stress this item enough: If you ride at night, get a rear light! I just read your BicycleSafe article. I've been riding in cities (mainly Cleveland and Winnipeg) for 45 years or so. I've experienced all of the types of incident you describe. Fortunately I only got knocked off the bike once many years ago - a left cross in a thunderstorm going too fast with a gale behind me - dummy! Bike brakes don't work as well in the rain and drivers don't have the visibility. I'd encourage cyclists to keep the speed below about 15 MPH in city traffic. At that speed, I find I have the reaction time and stopping distance to handle most emergencies. Our sister site has everything we know about bicycle safety statistics. That's it, that's all we have, no need to ask if we have anything more. Everybody asks about this one, so here's the answer. Linking. Feel free to link to this page. The direct url is http://BicycleSafe.com. Here's a list of sites which link to us. If you'd like to link with a banner, feel free to use the How to Not Get Hit banner near the top of this page. Reproduction on websites. Feel free to reproduce any or all of the "How to Not Get Hit" article on your website, with or without modification. (Note that you will need to host the images yourself.) Just make sure to link back to this site in the credits of your page. Reproduction in printed form. Feel free to reproduce this content in printed form (newsletter, ride brochure, etc. ), with or without modification, but please list BicycleSafe.com or Michael Bluejay in the credits. Your publication must be free. You're free to republish this info and redistribute it for free, but you can't charge for it. Daily/weekly newspapers and newsletters that go out only to paid members of a cycling club are okay. The contents of BicycleSafe.com are Copyright ©1998-2008 by Michael Bluejay and may not be sold for profit. I have developed this page to provide what I believe is very good advice to help you avoid getting hit by cars. But of course, bicycling will never be 100% safe, and I can't guarantee you won't get hit by a car, even if you follow all the advice on this page. (Naturally, I believe if you follow this advice you will be much less likely to suffer a collision than if you ignore it.) Ultimately, you are responsible for your own safety. A plug for another site of mine. I was born into a cult called Aesthetic Realism. Now I run a website where ex-members share their stories about it. Check it out at NewYorkCult.com. One of the biggest mistakes that people make when they start biking is to take the exact same routes they used when they were driving. It's usually better to take different streets with fewer and slower cars. Sure, cyclists have a right to the road, but that's a small consolation when you're dead. Consider how far you can take this strategy: If you learn your routes well, you'll find that in many cities you can travel through neighborhoods to get to most places, only crossing the busiest streets rather than traveling on them. Too obvious? Well, if it's so obvious, then why do most night-time cyclists ride without lights? Bike shops have rear red blinkies for $15 or less. Headlights are just as important as rear lights. And modern headlights use LED's so the batteries last ten times longer than old-school headlights. Cars at intersections ahead of you can see you better if you're squarely in the road rather than on the extreme edge where you're easily overlooked. You might worry about slowing down the traffic behind you if you take the lane. But if you're on the kind of street where you've got cars blocked up behind you or constantly changing lanes to get around you, you're probably on the wrong street and should find a quieter neighborhood street. Taking the lane works especially well in most traffic circles. The traffic generally moves slower so it's easy to keep up, riding in the lane makes you more visible to motorists, and taking the lane prevents motorists from right hooking you as they exit the circle. There are risks to both riding to the extreme right as well as taking the lane. Whether you ride to the right or take the lane depends on the conditions of the roadway you're on. On wide roadways with few intersections/driveways, right further right. On narrow roads with lots of intersections, ride farther to the left. It's not always better to take the lane or to hug the curb; it depends on the roadway you're on. You're less likely to get hit when your movement doesn't take motorists by surprise. Let them know you're about to turn or move left or right by signalling with your arm. Point your left arm out to move left, and point your right arm out to move right. (You might have learned an old way of signaling a right turn with your left arm, but drivers have no idea what that means, so it's useless. Signal a right turn with your right arm.) Before signaling left, be sure to check your mirror or look behind you before signaling (since a car passing too closely can take your arm out). It's more important to hear what's around you when you're biking than when you're driving. Whether you want to ride with headphones is your choice, but doing so does increase your risk. Similarly, texting or talking with a mobile phone raises the risk level. When you're mixing with car traffic, the fewer distractions the better. Also, you'll want both hands free in case you have to brake suddenly. 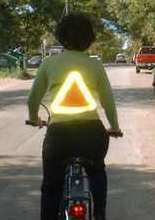 It's often helpful to ride in such a way that motorists won't hit you even if they don't see you. You're not trying to be invisible, you're trying to make it irrelevant whether cars see you or not. If you ride in such a way that a car has to see you to take action to avoid hitting you (e.g., by their slowing down or changing lanes), then that means they will definitely hit you if they don't see you. But if you stay out of their way, then you won't get hit even if they didn't notice you were there. On very fast roads cars have less time to see you because they're approaching so fast. Of course, you should avoid fast roads in the first place if at all possible, unless there's plenty of room for a car and a bike side by side. And if there IS such room, then on fast roadways, you can practice invisibility by riding to the extreme right. If you're far enough right that you're not in the part of the lane the cars are in, then they'll zoom by and won't hit you, even if they never saw you. Remember that in many cases you'll need to take the lane, in which case you're counting on motorists to see you. Around 33,000 people die in car crashes in the U.S. each year. About 1 in 41 is a bicyclist. This excellent animation from TrueMajority shows in graphic detail (using Oreo cookies) how ridiculously, ridiculously large the military budget is, and how we could solve many domestic problems with a modest 10% cut. The animation is slow to get started but then it gets much better. A must-see.